A Touch of the Past: It's Mulberry Time! I just picked my first bowl of mulberries from the tree in my backyard. I have ambitions to make jam with them, but I can't pick enough before the bloodthirsty mosquitoes drive me out. I may have to resort to the old 'shaking' method. Back in the day, when it was mulberry time my siblings and I would take an old bed sheet and some ice cream buckets, and walk down the fence line in the fields near our house. There were several big mulberry trees that were covered in the juicy black fruits. My brother would climb the tree and shake the branches, and the tree would rain berries onto the sheet that my sister and I held below. We would fill buckets and eat handfuls on the way home. While we scrubbed our purple hands, mom would make jam and syrup from the mulberries. Our favorite treat was fresh mulberries on vanilla ice cream. We still enjoy mulberry time in summer, but now my brother has a special pole and tarp to collect enough mulberries to make wine. 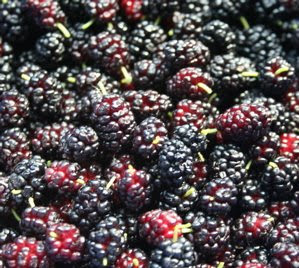 How to use mulberries: This sweet fruit can be used in any berry recipe, and they also mix well with other fruit.